Instead of a dramatic conclusion to the first of six trials of police officers in the death of Freddie Gray, the mistrial left Baltimore in suspense and confusion, with no immediate understanding of what happens next. The court has yet to set a new trial date. In the meantime, the city had braced for a possible repeat of the protests, destruction and dismay that engulfed the city in April after Gray's neck was broken in the back of a police van. But several small marches ended peacefully overnight as the community tried to process the news. Baltimore Circuit Judge Barry Williams acknowledged the hung jury Wednesday after the panel deadlocked over whether Officer William Porter had committed any crimes by failing to take measures that might have saved the life of the young black man, who was shackled and placed face down in the wagon after running from police. Back at square one, prosecutors and defense attorneys met in Williams' chambers Thursday morning to discuss dates for a possible retrial. A uniformed deputy stood guard, and when the lawyers left about 30 minutes later, they declined to comment, citing the judge's gag order. Maryland judiciary spokeswoman Terri Charles says lawyers confer again with the judge in the coming days, and that to her knowledge, prosecutors have not yet decided whether to retry Porter. The situation delays closure for an anxious city, and is unfortunate for both sides, said Steve Levin, a Baltimore defense attorney and former federal prosecutor. "The state proved beyond a reasonable doubt that Freddie Gray died. Beyond that, they weren't able to prove anything," Levin said. "They proved a tragedy, but I don't think they proved a crime." Jurors deliberated for three days over whether Porter committed manslaughter, assault, reckless endangerment and misconduct in office. In the end, they said they were at an impasse on every charge, and that a unanimous verdict was impossible. For a week, Democratic Mayor Stephanie Rawlings-Blake had urged citizens to remain calm and peaceful no matter the outcome, while Police Commissioner Kevin Davis canceled leave for the department's officers in anticipation of the jury's decision. Now many are wondering what comes next. "I'm not expecting our community to repeat April," said Erika Alston, a community leader who runs an afterschool program in West Baltimore. "But it is a bit of a kick in the chest." 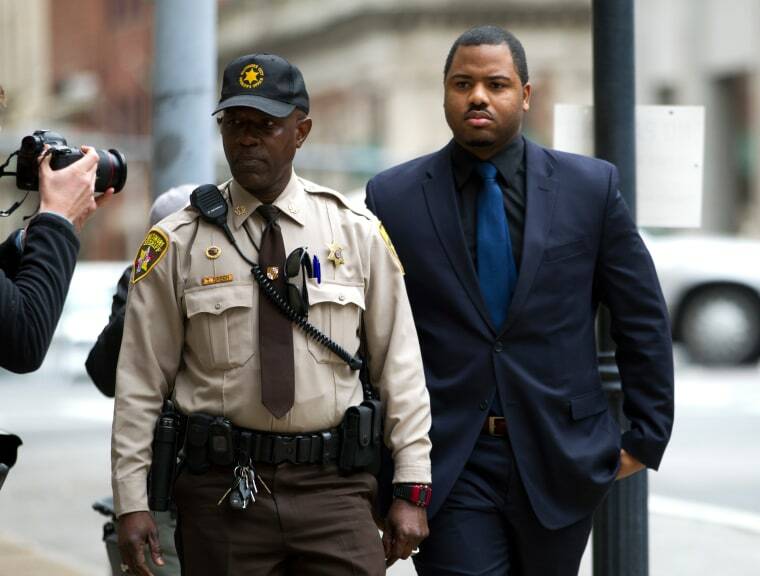 Prosecutors said Porter shares blame for Gray's death on April 19 because he didn't call an ambulance when Gray said he needed to go to the hospital, nor did he buckle Gray into a seat belt that would have prevented him from being injured inside the metal compartment if the van turned sharply or braked suddenly. Porter told jurors he didn't think Gray was injured when he lifted him from the van's floor to the bench, and that buckling him in wasn't his responsibility. He said he told the van driver, Caesar Goodson, to take Gray to the hospital, and that the wagon driver is in charge of making sure a prisoner is strapped in while the van is moving. Goodson faces the most serious charge of second-degree "depraved-heart" murder. His trial is scheduled for Jan. 6. He also is charged with manslaughter, second-degree assault, reckless endangerment and misconduct in office. Prosecutors intended to call Porter to testify against the driver and another officer whose trial is slated to begin after Goodson's. The mistrial may complicate this strategy, since Porter has a Fifth Amendment right not to incriminate himself, according to attorney Warren Alperstein. Options could include granting Porter immunity in exchange for his testimony, trying to persuade the judge to postpone the other trials while retrying Porter, or striking him from their witness list altogether. David Harris, a law professor at the University of Pittsburgh with expertise in policing issues, said State's Attorney Marilyn Mosby created a false impression that convictions would be simple to obtain by moving so swiftly after Gray's death to charge six officers. "It was never going to be easy. Prosecution of police officers is never easy, but when you look at some of the facts in this case, you've got to understand nothing here is a slam dunk," Harris said. Gray's stepfather, Richard Shipley, said the family is looking forward to another evaluation of the case by 12 fresh jurors. "We are not at all upset with them and neither should the public be upset," Shipley said Wednesday. "They did the best that they could. ... We are confident there will be another trial with a new jury."